November 20th marks the last day of Trans Awareness Week — seven days dedicated to giving voice and visibility to trans and gender non-conforming individuals — which culminates today with the Trans Day Of Remembrance (TDOR). TDOR honors those who’ve lost their lives in anti-trans violence, serving as a poignant reminder of both the struggle against hate and marginalization, but also the strength and resilience of the community at large. Indeed, the numbers are bleak; you’d have to be incredibly naive or exceedingly callous to not be disturbed by statistics surrounding the trans experience, both here and abroad. Transgender Europe’s Trans Murder Monitoring (TMM) project reported that at least 1,700 transgender and gender non-conforming people were murdered in the last seven years; twenty-two people have been killed so far in 2015, nearly twice the number compared to last year, according to the National Coalition of Anti-Violence Programs (NCAVP). 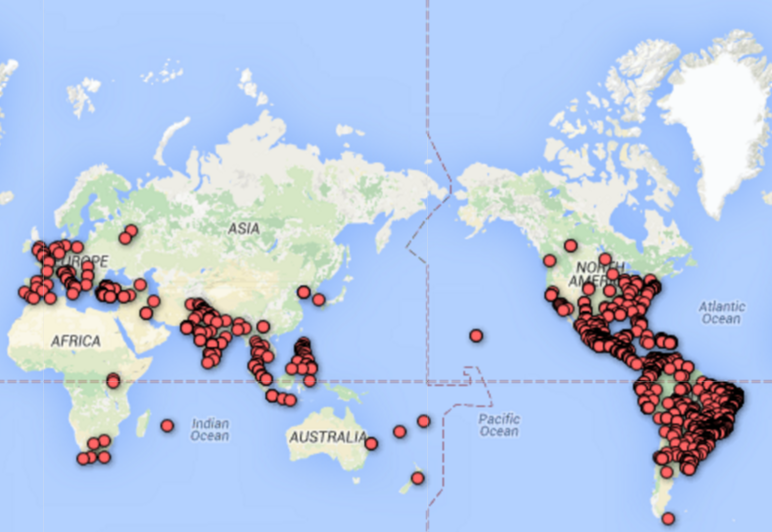 Every death in the past seven years of trans + gender non-conforming individuals globally. Data from Transgender Europe’s (TGEU) Transrespect versus Transphobia Worldwide research, TvT. But. Changes are underway that finally reflect the decades of work that trans folks have championed, again and again, demanding to be seen, heard, and understood. Just this past Tuesday, lawmakers gathered alongside advocates in Washington D.C. to announce an unprecedented action: the creation of a Transgender Equality Task Force, dedicated to addressing the violence and discrimination plaguing the trans community in the United States. Audre Lorde Project of New York City paired with Bazant; BreakOUT! 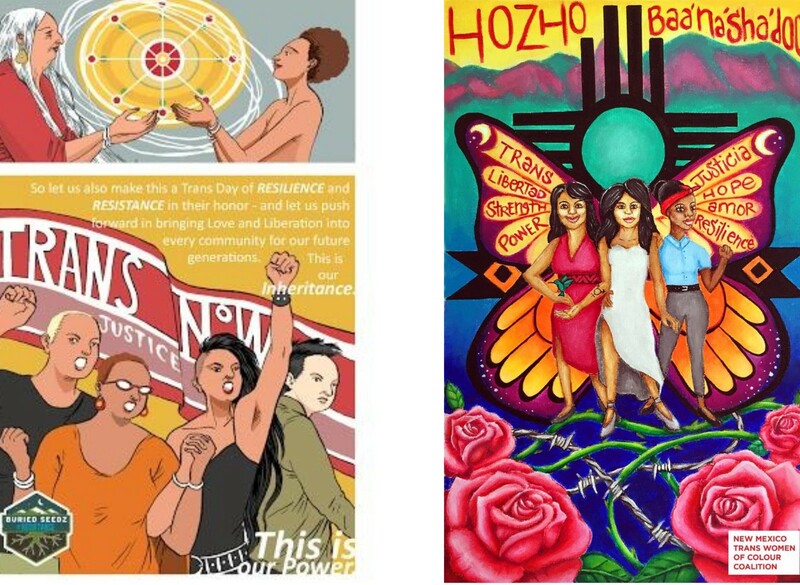 of New Orleans paired with B. Parker; Coalition of Trans Women of Color (led by Young Women United) of Albuquerque, New Mexico paired with Adelina Cruz; Transgender Law Center, a national organization,paired with Mohammed Fayaz; Buried Seedz of Denver, Colorado paired with Bishakh Som; SPARK Reproductive Justice NOW of Atlanta paired with Ebin Lee; TransLatina Coalition, a national organization, paired with artist Rommy Torrico; and Black Lives Matter, a national organization, paired with artist Wriply Bennet. The Establishment sat down with Wriply, B, and Ebin to discuss the intersection of activism and art, and their dogged fight to give the trans movement increased visibility and help shed the myopic narrative of oppression, violence, and stigmatization that too often dominates the discourse surrounding trans folks’ lives. Katie: How and why did you decide to become involved in this project? Wriply: Because the visibility of trans people of color, trans stories, and trans art produced by trans people of color is a huge way to move forward and build a safety net for our community. Also I love Micah Bazant and their work . . . they didn’t even have to finish their sentence before I jumped on board. B: Mainly because I feel it is important to spotlight the voices of trans people of color, particularly black transwomen, as I have noticed that our experiences, voices, and visibility in queer communities, as well as the public eye, have been overlooked for the most part. Plus it was a unique opportunity to connect with another group of activists in Louisiana advocating for the same things I am here in Texas. Ebin: I decided to join after realizing that I have a lot to say about everything going on and this campaign in particular embodied everything I believe in when it comes to Black people reclaiming their own narratives. I also was honored to be making art alongside so many important people. By B. Parker. BreakOUT! seeks to end the criminalization of lesbian, gay, bisexual, transgender, and questioning (LGBTQ) youth to build a safer and more just New Orleans. Katie: Why is the Trans Day of Resilience Campaign important? Both on a political and a personal level? Wriply: TDOR is important for the community, but what’s also important — not just for the community but for the youth, for society, and even folks in other countries to see — is that we don’t just mourn our lost, we also stand up, get off of our knees and do the work for future trans queer people of color (TQPOC) to have a strong foundation, rooted in self love, strength, and wisdom. [So they know] they have elders who fought for them, that aided them in continuing the fight — we are dying out here and we are dying quite young. It’s important for us to be visible, resilient and constantly moving forward for a brighter and stronger future for TQPOC youth. We know how we can impact the world and our community. B: How can someone celebrate who they are when all they are reminded of is the violence, tragedy, and mourning when reflecting upon the trans community to which they belong? That’s not cool. We are here to love, live, and fight! Rewriting the meaning of TDOR by highlighting resilience is, in my opinion, a radical move. The media tends to focus on the deaths of transgender people of color but rarely are our stories used to uplift the queer community or enhance our visibility within our intersecting communities. Personally, I want to celebrate the life I have, the vitality of my friends and loved ones, and share a message of prosperity, achievement and solidarity with other Black trans folks. It’s high time we write our own story. Ebin: We have so much to say and so many ways of saying it. It’s important to fully honor our own legacy. Our living and our dead, and the many different levels of being we have. There’s no one who can do this as well as we can. Katie: What is art’s role in social justice — do you think it has the power to actualize change? Wriply: Art translates: when faced with art, if it doesn’t impact you in some way, you’re not living. Art’s role in social justice is to freeze time, shift thoughts, spark a fire, start a conversation. In social justice work, art plays a strong role in building a level ground for our leaders to convene on. When people think this movement is over (which it might not ever be . . . who knows) years from now the art will remain . . . digging up thoughts and memories long forgotten, but still as fresh as wet paint. B: To quote Nina Simone, “An artist’s duty, as far as I’m concerned, is to reflect the times.” This resonated with me deeply. Behind every revolution is a group of artists fighting to bring the struggles of their community to the forefront through music, dance, film, and in my case, visual art. Artistic expression in social justice feels right. It’s the type of grassroots push that strengthens the backbone of the revolution to unite our people with a singular vision simply because it mirrors the attitude and heartbeat of our marginalized community. And if it didn’t have the power to incite change and radical movement, we probably wouldn’t be having this conversation. Ebin: Art says things that can’t be said. Sometimes there are no words to describe tragedy and injustice and likewise the beauty of life can also be something words can’t grasp. Us creating art tells the world we are here, refuse to be quiet and see ourselves even if aren’t being seen. And us seeing ourselves is powerful and creates change. Katie: Can you talk a bit about the pieces you created for this project? 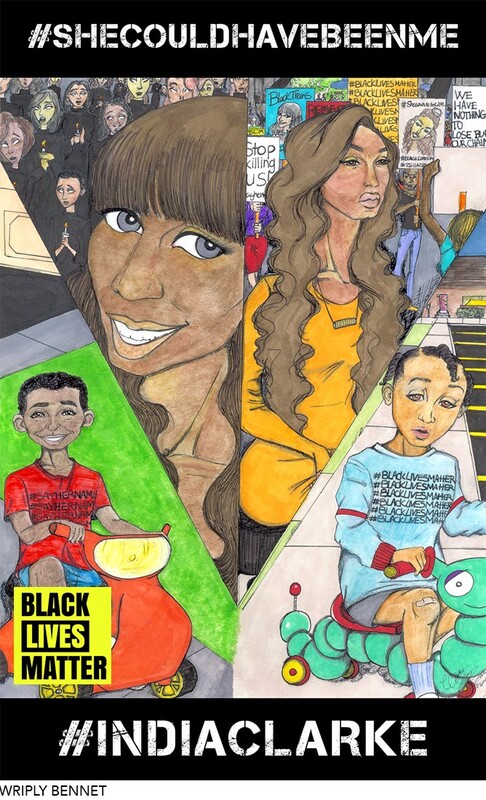 How does the Trans Resilience Campaign and the Black Lives Matter movement overlap and inform each other? Wriply: This piece is a result of having a strong dialect and courageous conversations within the black and TQPOC community. It’s no secret that within the black community TQPOC issues weren’t often seen as black issues . . . and sometimes still aren’t. I remember someone once telling one of my sistahs for us to “wait our turn” when the lost lives of black trans women were bought up in conversation surrounding black injustice, and this was only a year ago . . . we must continue to hold ourselves and each other accountable, so that we may rise together, stronger tomorrow than we were yesterday. Black Lives Matter really took from the conversation, and stepped up to the plate, changing that thought for a lot of folks in the community, Inviting black trans, gender non-conforming, queer folk to hop on board and control the narrative. Stating that “if what we see are 2 communities, with completely different issue,” therein lies the problem, because they see black people, with black issues. I couldn’t be prouder to be in cahoots with Black Lives Matter and for having trans leaders lead the conversation; we will continue to inform each other for a stronger future. B: On the whole, this piece is a part of me. It’s a part of the people at BreakOUT! and it is a part of, what I think to be, every Black trans person. It’s a common thread we share and I believe it speaks of a familiar queer story that we’ve all touched on in one way or another in our lives. Going into the project, I was unsure how I could visually express resilience and perseverance while still honoring the original intent of Transgender Day of Remembrance. Without being able to reflect on those that came before us, we, as a community, cannot begin to make the necessary steps going forward to uplift and support our brothers and sisters. The intersection of the two is that all black lives matter, including and especially black trans lives. The Stonewall riots were enacted by queer, black trans women, but the media recently (and continues to) whitewash their moment in history, but their story matters; their lives mattered. We were there then and we’re going to be here tomorrow. 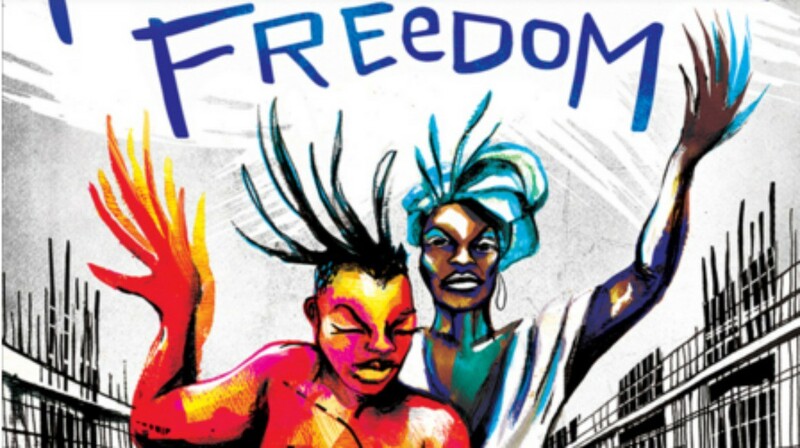 Saying that black lives matter automatically includes the lives of black trans people, and as a community, black folks have always celebrated our resilience and resistance to allowing our stories to be erased in the face of injustice. Katie: Ebin, your work has a Picasso-esque vibe. Is this fragmented/distortion representative of your work? Why the mirror? What significance does #SayHerName have you for? Ebin: My piece is a tribute to the living and dead. I want to honor the beauty of those past and living. The fragmented parts in the pie represent different people. And seeing ourselves in each other. 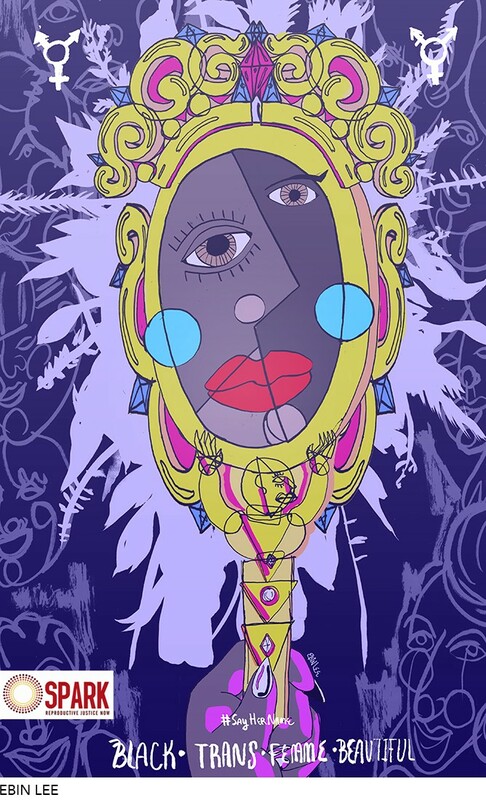 Katie: Wriply, your work focuses on India Clarke, a young transgender woman who was murdered this past July. Can you talk a little about why you chose her as the focal point of your piece? Wriply: It wasn’t really a conscious decision — I’ve drawn all the girls many times. I want to take and highlight each of the girls creating a campaign around them. Every time I draw the girls, it takes every bit of my strength to get through the list, and to even add those who weren’t on the list of girls we lost. In fact it’s when I reach India on the list that I have to walk away and breathe or drink . . . I identify so much with all of the women we’ve lost. Reading their stories makes me sick because of how very easily this could have been me. So I didn’t chose India in spite of the other’s — I could have chosen any of the girls, and it would have been as equally hard to accomplish. SPARK Reproductive Justice NOW’s mission is to build new leadership, change culture, and advance knowledge in Georgia and the South to ensure individuals and communities have resources and power to make sustainable and liberatory decisions about our bodies, gender, sexualities, and lives. Katie: B, your work prominently features the quote, “Give us our roses while we’re still here.” What does that mean to you? What does it mean to the movement? B: For me, it is simple: celebrate my life while I am living it. Roses can be a symbol of friendship, love, and acknowledgement of achievement, but are often associated with mourning the loss of someone close to us. 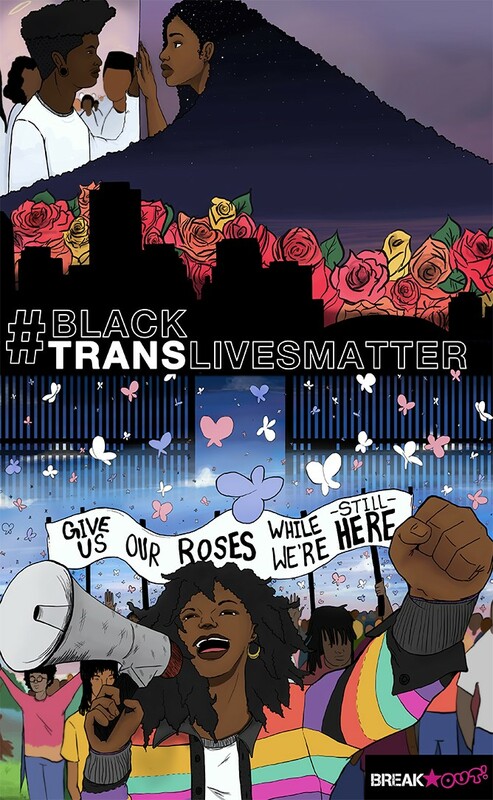 Reframing the giving of roses in relation to trans lives immediately lets people know that we want to be cherished and honored while we walk the earth. For myself, I, too have brought roses to vigils to honor the lives of fallen stars, but since completing this project my own relation to the act has shifted. Because transgender has become a buzzword in the media in recent years, I think it is of utmost importance that we focus on the lives of trans people and not their deaths by reminding the public that we are not a “trend,” that we’ve always existed. We have a chance to write our own narrative on this one, and it starts by acknowledging the members in our community as living testaments to our shared history as Black people as well as paying direct attention to our common thread of being trans. co-founding editor | creative director, theestablishment.co writer. fledgling filmmaker. singer. nail biter. whiskey swiller. bibliophile.